Teach functions and the repeat and delay commands with this coding concept box! Perfect for classrooms, scout troops, homeschool groups, and after school programs! Classroom boxes build on each other over time, introducing more complicated coding projects and coding commands as you go. We recommend starting with Box 1: Coordinates. The projects inside this sky-themed box provide practice using functions and the repeat and delay commands. 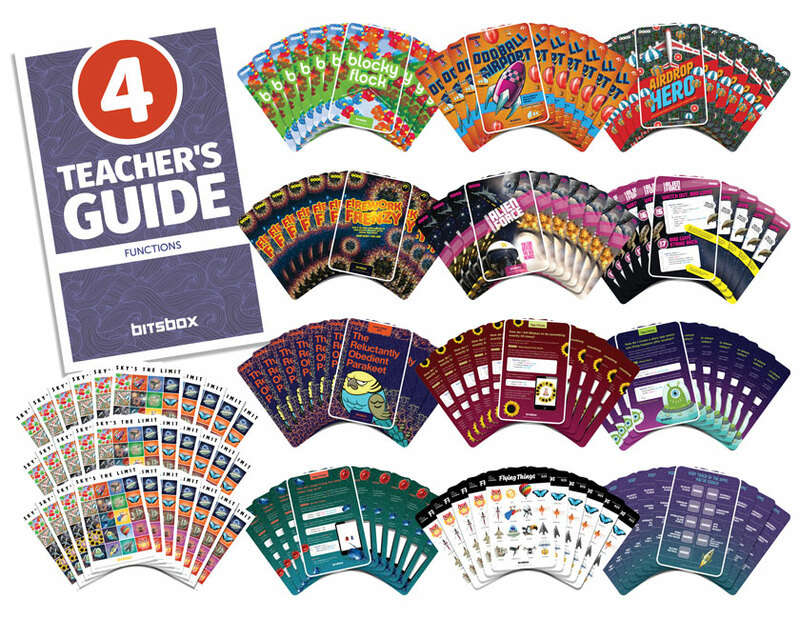 The Teacher’s Guide explains the use of functions and the Bitsbox repeat, delay, and .tap commands. There’s also a glossary for each coding project detailing project complexity, coding concepts included, instructions on how to use the app, suggestions to alter the app, and a URL to see the app in action. Blocky Flock: Make a flock of blocky birds. Tap tap tap as many as you can! Oddball Airport: Tap to launch all kinds of crazy aircraft! Airdrop Hero: Deliver packages from a giant cargo plane! Firework Frenzy: Launch hundreds of loud, beautiful fireworks just by tapping your screen! 1 challenge app: Challenge your kids to write their own apps! We provide descriptions and lots of hints. 2 Tips and Tricks cards: Step-by-step examples that reinforce these concepts. How do I make a bug run away when I tap on it? How do I tell Bitsbox to do something exactly 50 times? How do I create a story app where one thing happens after another?